De was born and raised in Northern California. De took a early interest in art and excelled in anything she could possibly get her hands on. In 2011, after being unhappy with the structured 9-5 job, De sought to further her art career by successfully seeking a tattoo apprenticeship. After completion of her apprenticeship she was drawn to San Diego’s warm weather and tattoo scene. Although tattooing is her primary artistic outlet she enjoys many mediums including: acrylic, oil, watercolor, graphite, color pencil, charcoal, sculpture, and digital art. Over the years, she has worked closer to her art degree and hopes to complete it in the near future. In her leisure time she enjoys spending it with her daughter and family. 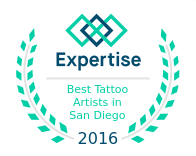 All-around De is a versatile artist who is ready to bring your tattoo vision to life. 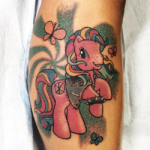 Specializing in bright and bold tattoos, you know you will be leaving with something to cherish for a lifetime. To schedule a consultation or tattoo appointment with Austin, please call the shop or use the website contact form and our scheduling manager will get you set up with an appointment.